The Sturmtiger’s armament originated as a German Navy project intended to fire depth charges from shore positions at enemy submarines. The Army was impressed with its potential against fortifications, and after further development decided to fit it to a tank chassis to produce a Sturmgeschütz (‘Assault gun’, armoured vehicles with a primary role of providing fire support to the infantry). The only chassis that could mount the new weapon was that of the Tiger tank. This loaded RW 61 shows the ventilation shafts and short barrel. The weapon’s official name was 38cm Raketenwerfer 61 (RW 61). Unlike a conventional gun this fired rocket propelled projectiles containing a motor which continued to burn after the round had left the barrel. This allowed it to be fired from a short barrelled weapon without a loss in range or accuracy. In fact the RW 61 fired 1.5m projectiles from a barrel just 2m long. As the hot rocket exhaust would wash over the front of the vehicle crews were instructed to close the Sturmtiger’s hatches to protect themselves. Afterwards they had to switch on the ventilation system before opening the breech in order to clear any lingering fumes. The high pressure created by the rocket charge would have destroyed the gun if it wasn’t vented somehow. The solution was a series of ventilation shafts running from breech to muzzle. The distinctive ring of holes around the muzzle are the exhausts of these shafts. Photographs show that different Sturmtigers had varying numbers of exhaust shafts. Vehicles have been seen with 20, 30 and 31 shafts. The rockets had 32 nozzles in the base. The RW61 could fire two different types of ammunition. Both were attached to the same motor unit for propulsion and weighed the same. This gave them the same maximum range of 5500m. The Raketen Sprenggranate 4581 High Explosive round contained a 125kg charge. The report noted it was particularly effective against ‘massed living targets.’ There was a large danger area from fragmentation, ‘up to at least 500m,’ or even further if the round had been fused to air-burst. A view of the loading tray and open breech. 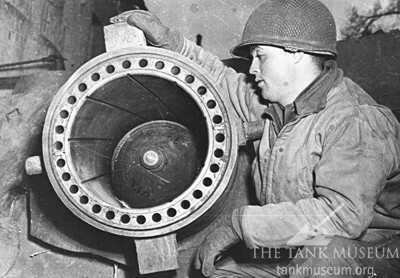 In contrast the Raketen Hohllandunggranate 4592 hollow charge was ‘specially suited for engaging stout concrete targets.’ It had a shaped charge warhead that could penetrate up to 2.5m of reinforced concrete. As both rounds weighed 345kg, they were far too heavy to be handled manually. 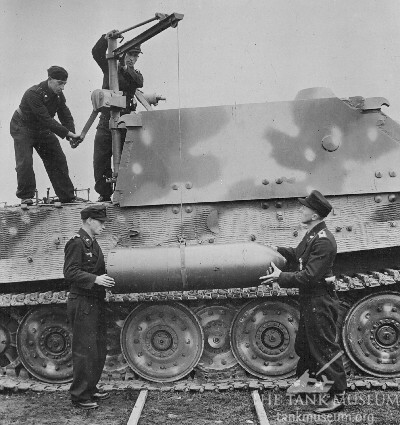 Loading them into the Sturmtiger was done with a small crane. 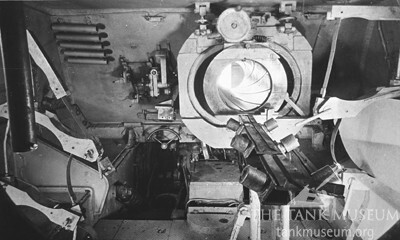 Inside the vehicle the crew moved the rounds into the breech ready for firing using a loading tray fitted with rollers. There was space for 14 rounds in the Sturmtiger, including one on the loading tray and one already loaded. See the Augmented Reality Sturmtiger in The Tank Museum’s Tiger Collection. 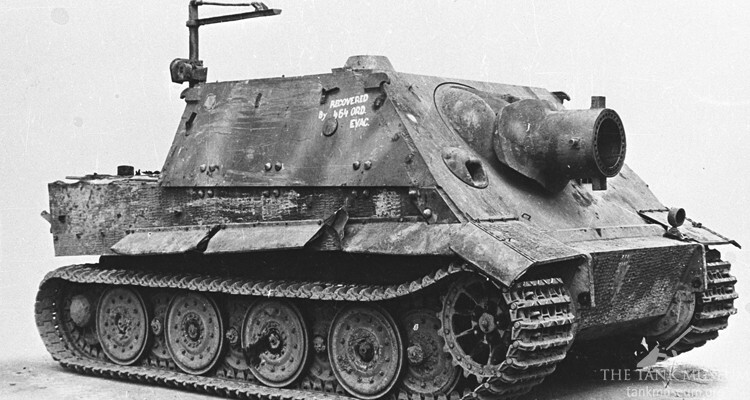 Find out more about the Sturmtiger here. Not bad! Well spotted about the differing number of vents, I questioned this some time ago but never got an answer. It’s worth noting the hulls were often used on tigers sent back for repairs. Although the Navy found little use for the launcher they were used up in Norway.